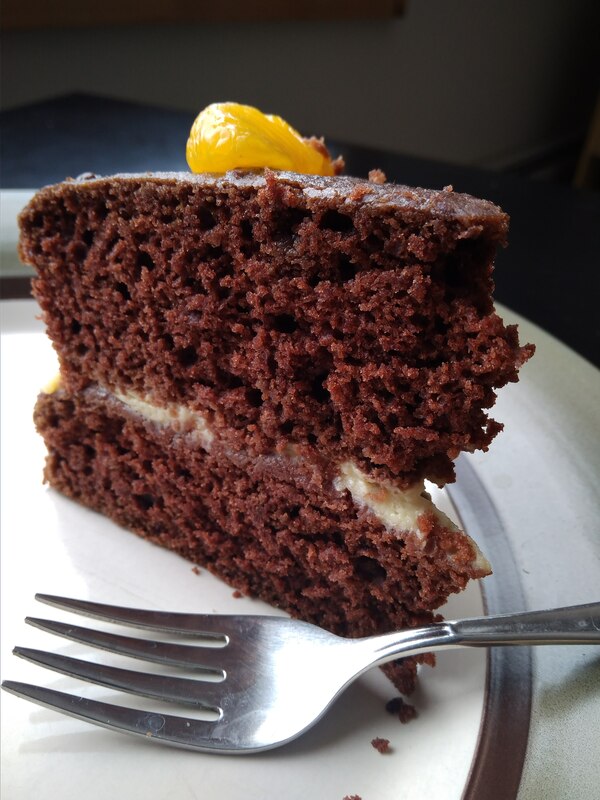 This past fall, I made a plant-based chocolate cake for a neighbor’s son’s birthday. It was a double layered 8 inch cake, and I wanted a frosting (without a ton of sugar!) that was plant-based for the middle. I searched online but didn’t really see any good recipes using a minimal amount of sugar, that was easy to whip up and called for ingredients I had at home. Most involved using quite a bit of powdered sugar. There were lots of recipes using Mori-Nu shelf stable silken tofu, but I haven’t been able to find that where I live. So….I decided to improvise and try something new – a bit risky as I had only about 1-2 hours before I needed to serve the cake! I had some left over medium firm regular refrigerated tofu sitting in the fridge, so decided to bravely experiment with it to make my dream frosting. And….it worked! This low-sugar, protein-filled and super easy recipe is what I now use for all my cakes. Use this frosting to cover the tops of muffins or cupcakes if you like. I have even used it as a filling for sandwich cookies with good results. And if your children want to eat your leftover cake frosting, let them because they’ll get a good dose of nutrients like calcium, iron and protein from it! A vegan, egg-free, dairy-free, oil-free, protein-rich frosting recipe you can whip up in no time! Take half a block of the Firm or Medium Firm refrigerated tofu (this is not the silken tofu product that comes in unrefrigerated boxes such as Mori-Nu brand or other brands) or what would be roughly equivalent to 1 cup of chopped tofu. Sandwich the tofu block with two pieces of paper towel and between two heavy plates. Let the water drain out of the tofu to soak the paper towels. After 10 minutes, remove and replace the paper towels with dry ones. Repeat this process again after 10 minutes with dry paper towels, then check the tofu. If the paper towels are quite wet, replace with dry paper towels and let the tofu be pressed for an additional 10 minutes. Once the tofu block is pressed relatively dry, remove the tofu from under the heavy plates and cut the tofu into cubes to fill a ‘1 cup’ measuring cup. Set aside. Halfway through the tofu draining process, you can start to prepare the soy milk mixture. Mix the cornstarch and soy milk until well blended in a small pot. Immediately measure out ¼ cup (or 4 tablespoons) of this soy-cornstarch mixture into a small bowl and stir in 2 tablespoons of maple syrup. Mix until thoroughly incorporated. Put this soy/cornstarch/maple syrup concoction with the cup of chopped tofu into a food processor and pulse for 1-2 minutes, stopping often to scrape down the sides of the container using a rubber spatula. 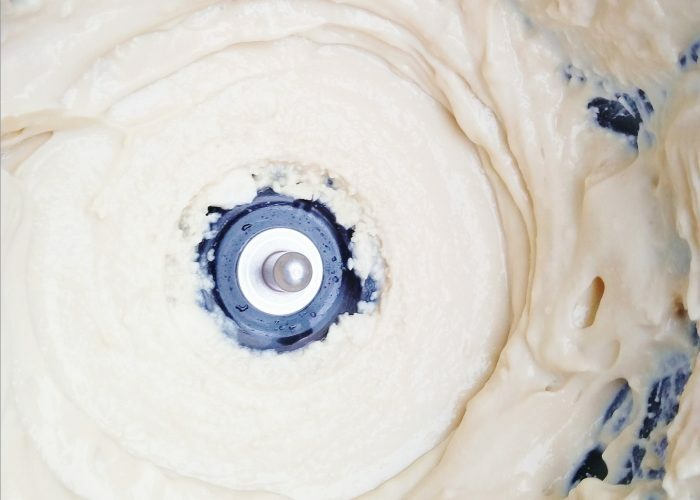 Once fully blended and mixed together, the frosting should be a smooth creamy texture. Check the consistency to see if you need to add a little bit more plant-based milk (add 1-2 teaspoons at a time as needed) or a little bit more sweetness. Follow the instructions as above, except add in 4 teaspoons of cocoa powder and an extra tablespoon of maple syrup into the food processor when blending. Pulse a few times until combined, stopping to scrape down the sides of the container as needed. If you would like a darker chocolate color, add another 1/2 to 1 teaspoon of cocoa powder to the food processor contents. Taste and further adjust the sweetness level to your liking. Follow the instructions as above, except cook a small beet while the tofu is draining. To do this: steam a beet for 10 -15 minutes (until a knife goes through the beet without difficulty), then let the beet cool. Remove the skin of the beet and finely dice up a slice of it to get a teaspoon of finely minced beets (you may want to wear gloves). For the rest of the beet, simply slice it up to use in your salad, soup or as a side dish for the next meal time! Add in the teaspoon of diced beets to the food processor contents with the soya-cornstarch mixture, maple syrup and tofu cubes. Pulse a few times until combined, stopping to scrape down the sides of the container as needed. If you prefer a darker pink or reddish hue to your frosting, simply add more diced beets (about a teaspoon at a time) to the food processor until the desired color is reached. Use the frosting on your cake or cupcake! While the tofu is draining, you could be doing other things in the kitchen, like finishing up the cake you are baking! If you like, you can also press out the tofu earlier in the day or the day before. Just keep the pressed tofu in the fridge to stay refrigerated until you use it to make the frosting. The finished frosting is soft and moist, and it stays that way, so don’t expect it to harden and dry up. This frosting will also have an off-white creamy tinge due to the brown maple syrup (the same if honey, brown sugar or agave nectar is used). So if you are looking for a completely white cake frosting, you may need to use powdered sugar or white sugar in place of the maple syrup. Since the powdered sugar or white sugar is not liquid, you can adjust the recipe by adding a teaspoon or two more of the plant-based milk when blending if needed. Keep the frosted cake, muffins or cupcakes refrigerated until serving time. Store leftover frosting or frosted baked goods in the refrigerator. This recipe is enough to provide a frosted middle layer and the top of a double decker 8-inch diameter cake. If you need enough frosting to cover the entire cake including the sides, it is best to double this frosting recipe. Finally, if you find the frosting slightly sticky especially at the top so that it is difficult to pipe words on it, you can dust the top with a fine thin layer of powdered sugar. This frosting doesn’t work well frozen, but it keeps in the fridge for at least 3-4 days, so you can make it beforehand. I love that this frosting recipe is so simple to put together and that it doesn’t require the silken tofu! When I served this vegan cake at the party later in the evening, everyone devoured it and only 2 pieces were left for the birthday boy to take home!